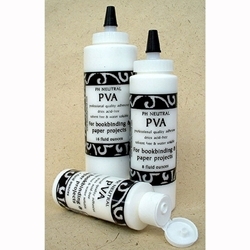 Archival, sturdy adhesives can be vital for book binding and paper arts. We have PVA (poly vinyl acetate), pure rice starch adhesive and pure wheat starch adhesive, as well as methyl cellulose which can be used for marbling. Rice starch and wheat starch need to be mixed with water to produce an acid free paper adhesive.